Being diagnosed with cancer can be one of the worst moments of your life. How did this happen? you wonder. You feel like the victim of a terrible crime and cancer is the perpetrator. How can you fight this awful injustice? Well, if you have been diagnosed with a blood cancer like leukemia, you may be able to enroll in a clinical trial for CAR T-cell therapy, a promising new treatment that activates your body’s defense system to fight cancerous cells. This therapy is currently being tested in hundreds of clinical trials around the world and Dr. Jae Park of Memorial Sloan Kettering Cancer Center is one of the many doctors and scientists researching this revolutionary blood cancer therapy. T-cells are the policemen of the immune system and constantly work to arrest dangerous criminals that can harm your healthy cells and organs. However, cancer is unlike other common felons. It is one of the stealthiest of criminals, highly skilled and dangerous due to its uncanny ability to escape under the radar of the immune system police force. Fortunately, CAR T-cell therapy, which involves genetically editing T-cells, gives the policemen a new high-tech surveillance system that allows them to catch these stealthy cancerous criminals. This surveillance system is a chimeric antigen receptor, or CAR. A CAR is an artificial receptor that sits on the surface of the T-cells and is specialized to target a CD-19 antigen, a marker on blood cancer cells. Scientists set the surveillance system in motion by inserting a gene that codes for CAR into T-cells extracted from the patient’s own body. This gene acts as a blueprint for the cell, giving instructions on how to create the chimeric antigen receptors. After this CAR blueprint is inserted into the T-cells, the cells are grown in a laboratory until the chimeric antigen receptors are expressed in the cell. Once this new surveillance system is up and running, the cells are returned to the patient’s body. 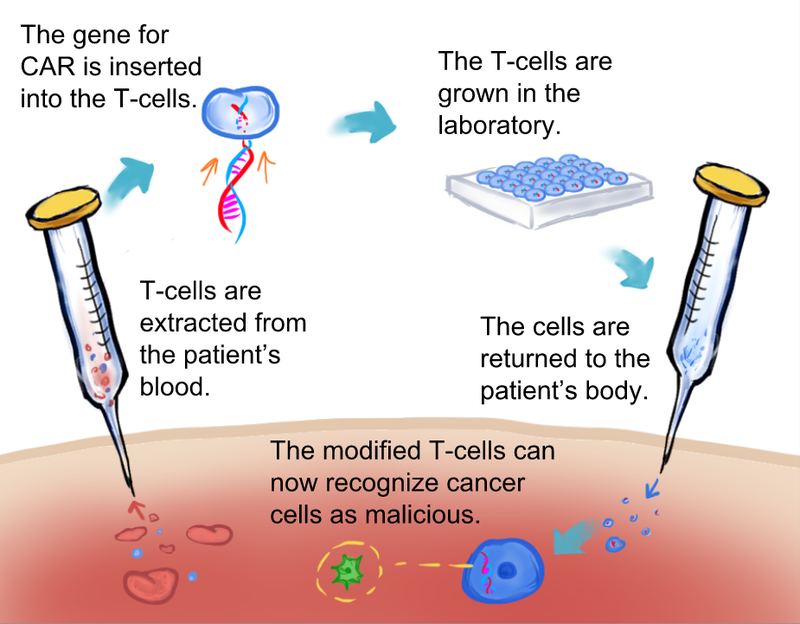 Inside the patient, the policemen are now armed with these modified T-cells that recognize the perpetrators, or cancer cells, as malicious criminals. The modified T-cells also call for backup from other parts of the immune system to destroy the cancer cells. Working together, the policemen and high-tech surveillance system have contributed to remission in 94% of blood cancer patients in clinical trials. Unfortunately, as with many cancer treatments, this therapy does come with some unpleasant side effects. According to Dr. Park, as a result of the T-cells attacking the cancerous cells and calling on the immune system, the patient may experience flu-like symptoms. Additionally, CAR T-cell therapy is still being researched in solid tumors, as they differ from blood cancers and warrant a different immune system response. With continued research and future breakthroughs, Dr. Park thinks CAR T-cell therapy may become the go-to therapy for oncologists around the world, helping put a stop to these deadly perpetrators and saving patients’ lives. Fernandez, Clara Rodriguez. “A Cure for Cancer? How CAR-T Therapy is Revolutionizing Oncology.” Labiotech. http://labiotech.eu/car-t-therapy-cancer-review/ (June 5, 2017). Maus, Marcela V., Grupp, Stephan A., Porter, David L., June, Carl H. “Antibody-modified T-cells: CARs take the front seat for hematologic malignancies.” Blood Journal 123 (April 24, 2017): 2625-2635. National Cancer Institute, “CAR T-Cells: Engineering Patients’ Immune Cells to Treat Their Cancers.” National Institutes of Health, https://www.cancer.gov/about-cancer/treatment/research/car-t-cells (June 5, 2017). My name is Rudra Amin. I am currently a junior attending the Academy of Allied Health and Science in Neptune, New Jersey. I enjoy learning and teaching math and science, especially biology and chemistry. This is my second year writing for cSw and it has been a great experience. In my free time, I enjoy playing tennis and ping pong. Very interesting article. You made this information very accessible for people who have no background in oncology. Well done! Thank you for checking out my article! I’m glad that you were able to understand the science involved in CAR T-cell therapy! Well done, Rudra! Thank you for your clever analogies, which make complex science understandable! Thank you for reading my article. I’m glad that the analogy helped you understand the science and research behind CAR T-cell therapy. Thank you for your interesting, informative, clear, comprehensible, and hopeful article. I look forward to reading more. Thank you for reading! I greatly appreciate your comment!